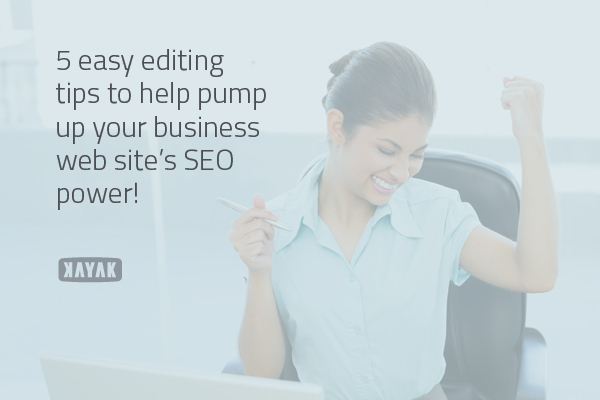 5 Easy Editing Tips to Pump up Your Website’s SEO Power! Do have a great-looking website with great content management system that allows you to add pages really quickly? Publishing content should be as simple as that right? While your webpage page be “flawless” a smarter approach to improvement would be to give your CMS and Content Optimization Strategy a helping hand so your content can be found easily! Below are 5 easy editing tips to help boost your business SEO power! 1. Have accurate page naming: Some marketers make mistakes by moving to fast when dealing with keywords and end up stuffing keywords into a limited amount of space. good thing to know about this is to use natural and relevant phrases that describe and relate to your webpage. This can normally be a problem when moving between servers. 2. Have worthy meta descriptions: Most marketers overlook their meta section of their CMS, which is the description you add to your new page. This shows up in the preview section of the search engine results. With good strategy you can bring people to your site with just the right words! Meat descriptions should be short, relevant, and inviting. 3. The right formatting for the job: You as a marketer must decide how you want your elements displayed. Adding appropriate tags like H1 for primary headings and H2 for subtitles is important.This makes the structure great for all readers . Allow Google to do its’job with keywords and you just have to include them to make your page easier to crawl through. 4. Have Alt image descriptions: This is another common thing that’s usually overlooked. The ¨alt image” description tells search engines who can’t see the pictures on your website. This is important because you want your images to fit the context just in case the image doesn’t load. BY labeling images, your customer will more likely come across your page when searching relevant material. 5. Actually publish, share, and engage you page: This is not a technical as the other 4 steps but a simple mistake people do is they forget to publish their material, share it, or engage on it, and never see results from this mistake. You want to always be engaged with your own content no matter what. Google with have better luck with finding your content if it was actually ¨live¨. There are many more steps including these to make your new webpage awesome. Just master these techniques and apply them and your website should be just fine! After you master the above steps, begin to build a better business website! These are some great tips! I will implement the first one more in my personal blog for the class! It is so easy for businesses to over look some of the simple steps that can help them out significantly and all of these steps are free to do. So many websites lose traffic due to not mastering these simple steps. I think if they just slowed down and took their time and are patient with their site and not trying to rush it out, more and more sites will get better traffic and the audience they are trying to reach. I agree! A lot of web tool kits, like wix and squarespace, make it really easy for small businesses to quickly create an aesthetically pleasing website they didn’t need web development experience to create. Unfortunately, they often don’t realize that their is more planning that needs to go into the website in terms of optimized content, landing pages, and the tips above that go past the ability to simply create a website and slap it online. To add another tip to this linking is also a key SEO practice. Search engines like Google have “spiders” that crawl the web to find an index websites. Inbound and outbound links that keep your website networked make your site easier for Google’s spiders to find and therefore more likely to be indexed and appear in search results.